We all know that Poland resisted the Nazi invasion and that Poles and Polish Jews bore the brunt of the Holocaust. But the world is now finding out all about Polish complicity in the Holocaust, thanks to its government trying to ban discussion of it. The new law, which took effect this week, prompted widespread criticism from Israeli officials and Jewish groups in the United States — as well as Polish historians, Germany’s foreign minister and the State Department. In an effort to defuse tensions, Poland’s far-right, nationalist government has promised that the law will not be enforced in the coming weeks, until it can be reviewed by the nation’s constitutional court. The clearest impact of the legislation has been to draw fresh attention to recent historical research which makes it plain that Poles rarely opposed and were frequently complicit in the persecution of their Jewish neighbors by the Nazis following the annexation of western Poland to Germany. 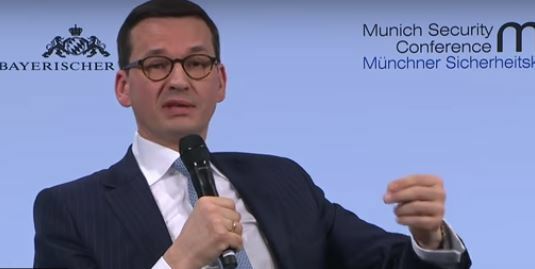 Pictured is Poland's Prime Minister, Mateusz Morawiecki, whose cunning plan to distract attention from Polish complicity in the Holocaust involved telling an Israeli journalist that Polish Jews were in on the complicity.